BIG Kaiser Precision Tooling Inc. has been adding digital boring head options since 2010, beginning with the Series 112 for small diameter finish boring. Recent additions covering the middle range and large diameter range mean the company now offers a digital boring head to cover the full spectrum of finish boring sizes and series. All of the new digital heads were designed geometrically similar to their analog predecessors -- same range, roundness, shape and height -- so you can swap an analog for a digital model without any reprogramming. 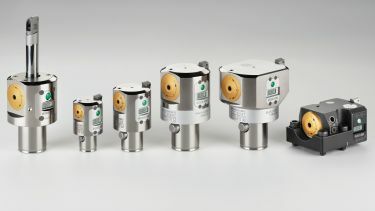 Also, existing Kaiser accessories such as shanks, extensions, reductions, slides, boring bars and insert holders are compatible with the new digital tools. Additional features shared across the entire digital lineup include an IP 69K seal rating (highest possible) and a coated body to assure complete resistance to contamination and corrosion. For ease of use, a single button is all that is needed to operate the digital readout and the large, high-contrast display relates diameter corrections. The tool carrier's measuring system shows the effective movement of the cutting edge and permits diameter corrections in both directions. The new Kaiser Series 310 EWD Precision Finish Digital Boring Heads use existing insert holders from program 310 EWN to allow maximum boring range per head and compatibility with existing special design insert holders. Five heads feature through-spindle coolant capability with directional coolant ports, and can perform back boring operations by simply reversing the insert holder. The accuracy of a digital display is also now available on the Kaiser Series 318 Large Diameter Finish Boring System. The light-weight system is based on aluminum extension slides to support a variety of aluminum, and some steel, components. The series also features through-tool coolant supply to the cutting edge, for optimum chip making and breaking. "These two new lines complement the Kaiser Series 112 EWD 2-54 line of digital precision boring heads for small diameters," says Jack Burley, BIG Kaiser vice president of sales and engineering. "Together, they cover the full range of finish boring needs."